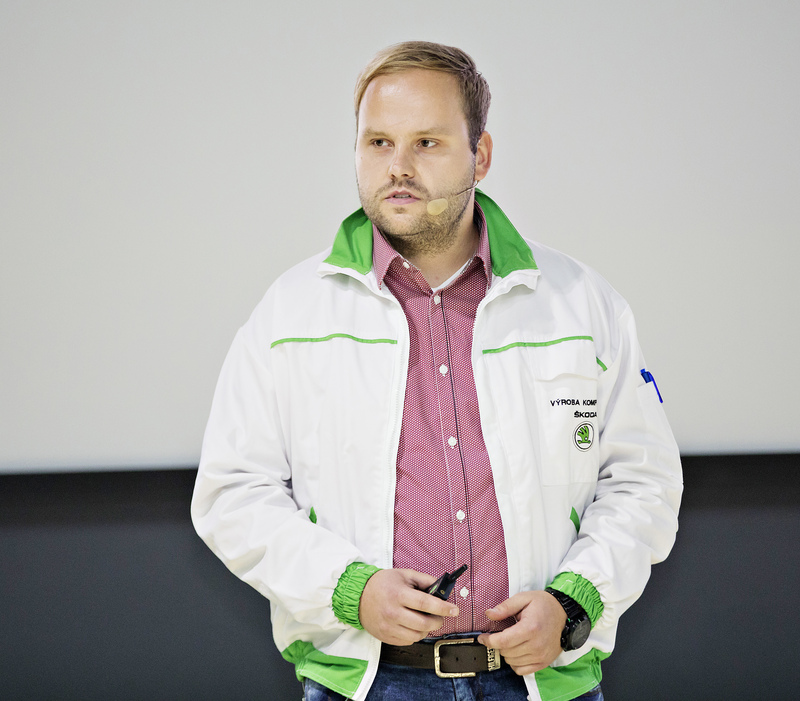 Take a look at how ŠKODA is attracting talent young people. 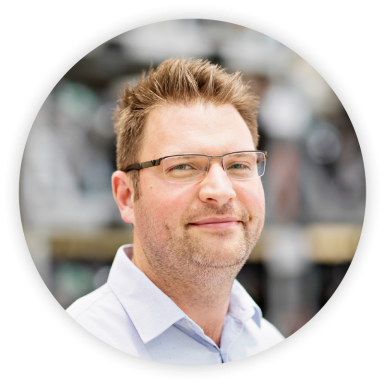 Numerous challenges lie in store for them and the industry at large – and not just because of e-mobility. Future mobility and e-mobility are topics with many question-marks hanging over them. 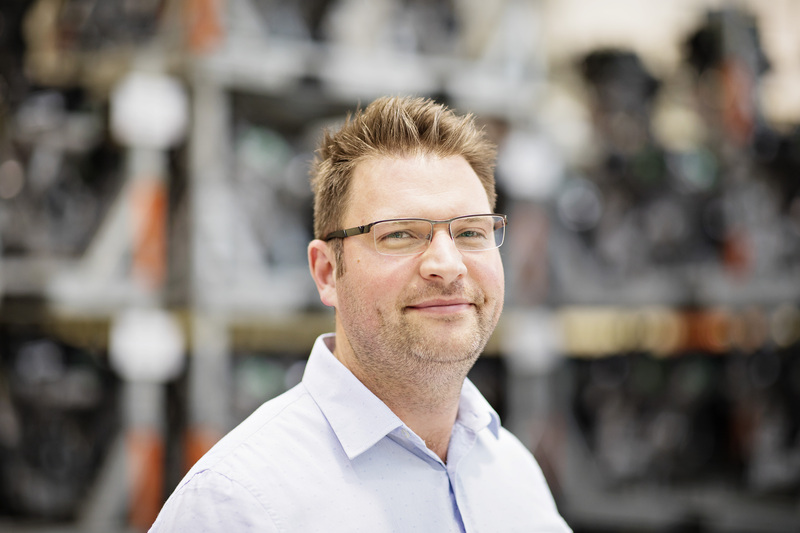 The automotive industry is faced with the challenge of finding answers. ŠKODA is well aware of the importance of this area and dealing with it in earnest. This is why experts, joining forces with students, have concentrated on e-mobility at ŠKODA DAY 2018. Several dozen engineering students from the Czech Republic and Slovakia, who are getting to the stage where they are looking around at job opportunities, met up at the modern ŠKODA Training Centre in Mladá Boleslav in early October, where a packed day of e-mobility innovations, including an excursion to the production facilities, had been prepared for them. 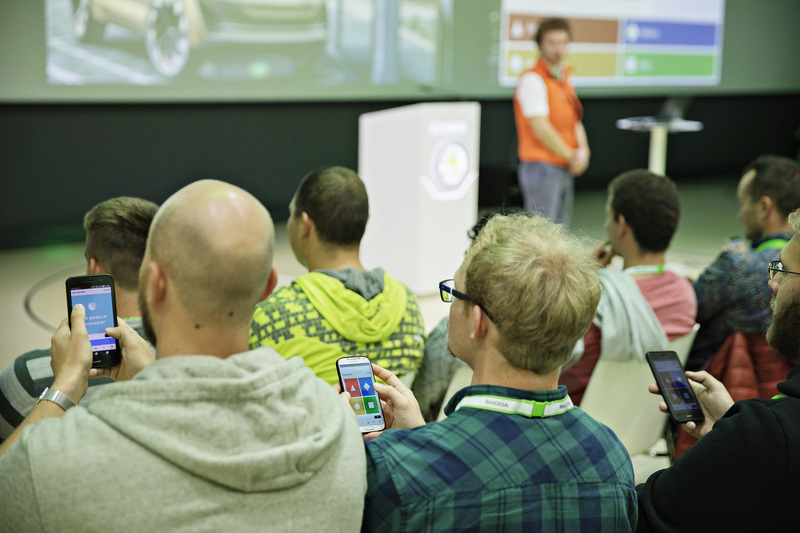 ŠKODA collaborates with talented young people to tackle future problems. During their studies, ŠKODA involves them in various talent programmes. Students are given the opportunity to take part in internships and to participate in doctoral and trainee schemes. 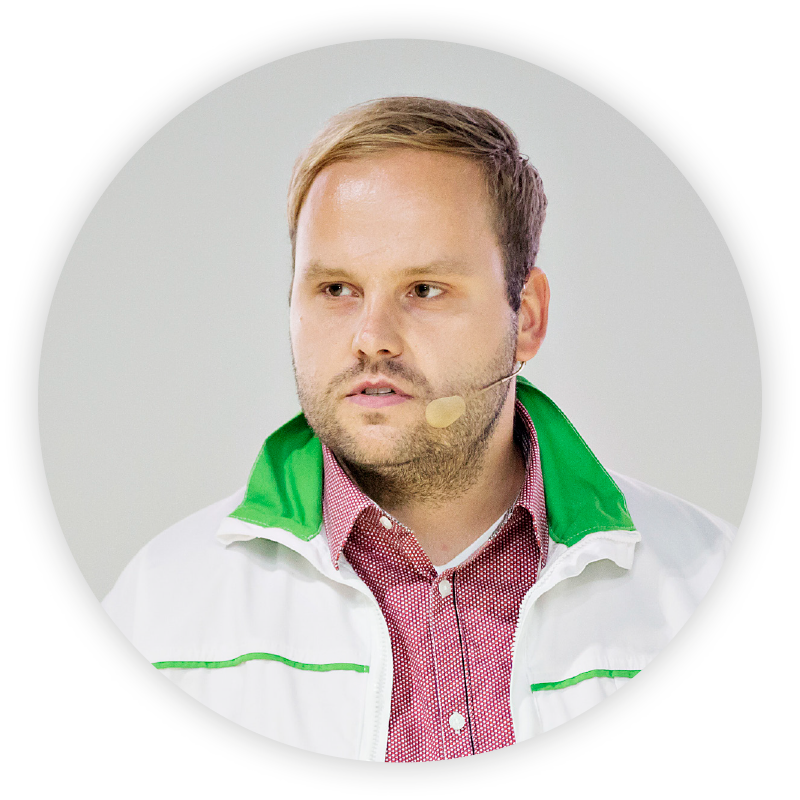 They can also write their theses in cooperation with experts from ŠKODA. Placements abroad, including in Germany, India, China and Russia, are also par for the course. E-mobility is a massive challenge across the automotive industry. 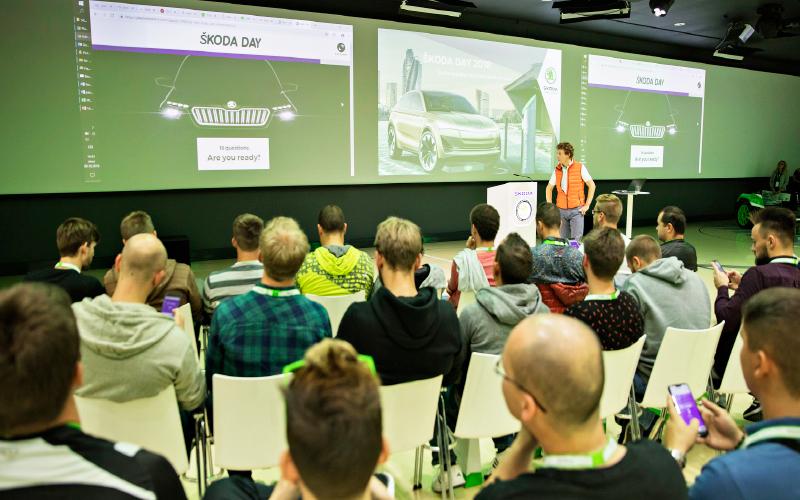 In their lectures, ŠKODA’s experts explained to students that future mobility solutions are not centred solely on the production of electric cars. Other major tasks here include the digitalisation of information systems and robotics. Nor should we lose sight of the necessary infrastructure. ŠKODA actively engages students studying wide-ranging subjects to address these and many other issues. In addition to cars, e-mobility also encompasses entire ecosystems, including new products, services, maintenance work and infrastructure construction. ŠKODA is moving forward to ensure that it is ready all round for the electrification of vehicles. This includes addressing opportunities to prolong the life of batteries and what to do with them afterwards, e.g. they could be used for domestic energy storage. Another challenge for the future is to shorten the charging period so that it is just as quick as refuelling an ICE (internal combustion engine) vehicle. 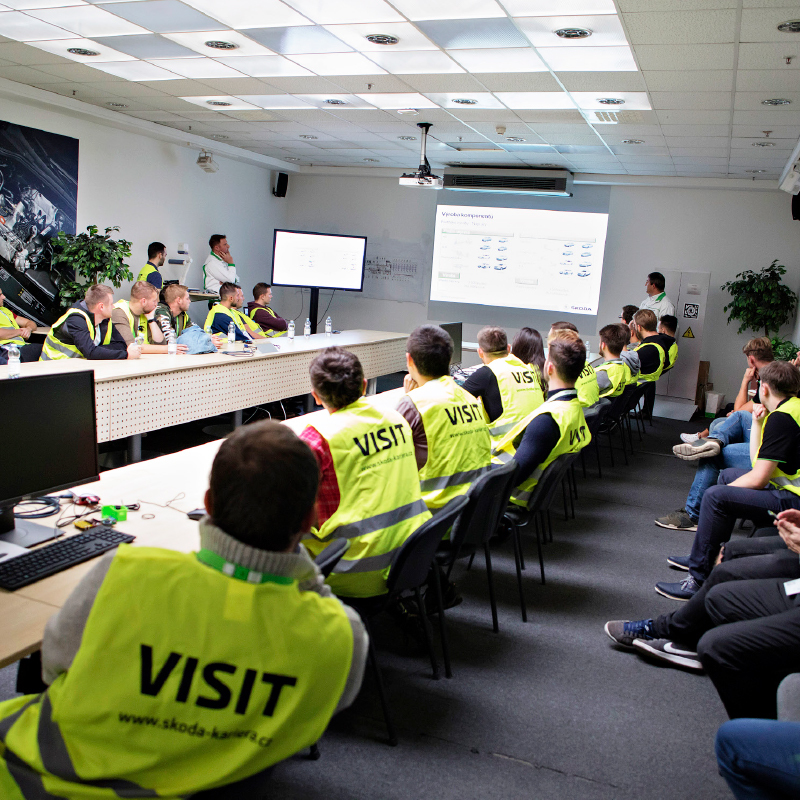 During their tour of the Mladá Boleslav plant, students were introduced to the technology in place on the new battery assembly line, and they were the first guests to see its construction during an excursion. And when it comes down to it, it’s better to see something once than to hear about it a hundred times. The tour was not just a walk through the factory. Expert guides prepared short interesting lectures incorporating practical demonstrations and tasks, so students could try out and experience for themselves real-world innovations using the latest technology, including 3D models and augmented reality. The students and experts engaged in lively discussions during the excursion, which continued after they returned to the training centre. 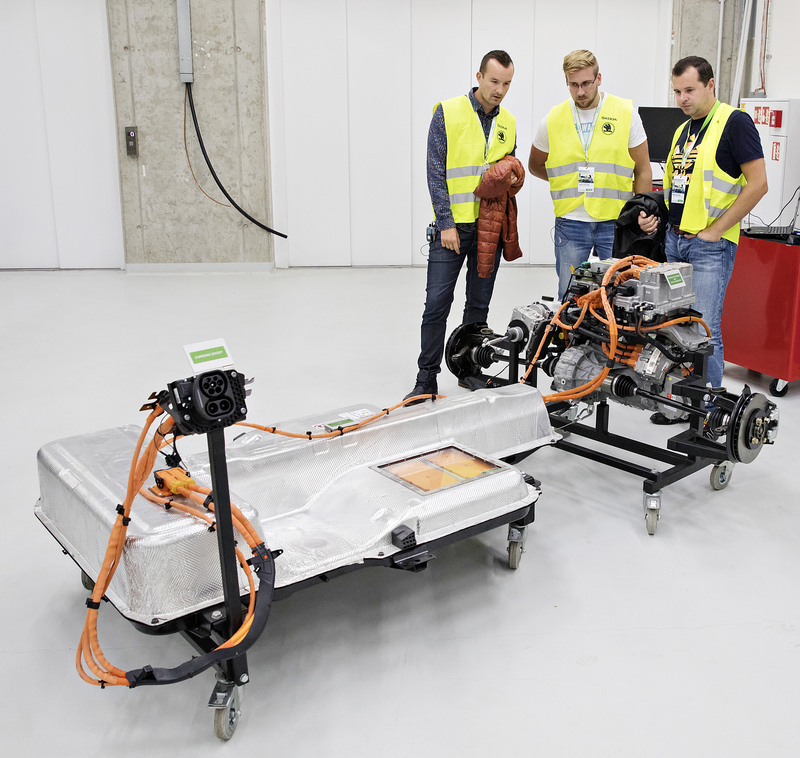 They were particularly inquisitive when they saw the hybrid-car battery and the ŠKODA VISION X, which are on display here. WHAT DID THE EXPERTS WHO ACCOMPANIED THE STUDENTS TAKE AWAY FROM THE EVENT? WHAT DID YOU THINK OF TODAY’S EVENT? It was excellent all the way through from the lectures to the excursion at our production plant. The students were keen. They were able to see the construction of the battery production line, as well as the battery that is going to be assembled on it. I was pleased how interested they were. DO YOU THINK THAT ELECTRIC CARS ARE AN AREA THAT IS ATTRACTIVE TO STUDENTS? Absolutely. During the discussion, there were lots of people milling around the battery stand, and a lot of interesting questions were asked. The students was clearly interested. WHY IT IS IMPORTANT TO WORK ON E-MOBILITY? As emissions are reduced, we need to look for alternative drives. The battery-powered electric motor is one of them. There is a growing demand for electric cars among customers, and various institutions are also placing a stress on cutting emissions in city centres. WHAT INTERESTED THE STUDENTS MOST? They asked about the battery, individual components, their parameters, the driving distance and what sort of impact the climate would have on their capacity. DID ANY OF THE STUDENTS ASK ANY QUESTIONS THAT YOU WEREN’T EXPECTING? Someone asked why we designed the battery the way we did. One of my colleagues explained that this was a tested, robust design that offers the best to customers. DID YOU GET THE FEELING THAT YOU WERE SEEING FUTURE COLLEAGUES AMONG THE STUDENTS? There were about 40 people in the group, and I reckon five or six of them showed a genuine interest. They could well join us at ŠKODA, which would be brilliant. WHAT WOULD YOU RECOMMEND TO STUDENTS WHO ARE INTERESTED IN E-MOBILITY? They can attend our events, both our ŠKODA DAY and others that we organise at universities, where they can contact our colleagues and express an interest in traineeships or in writing theses that will have real use in production. It was perfect. 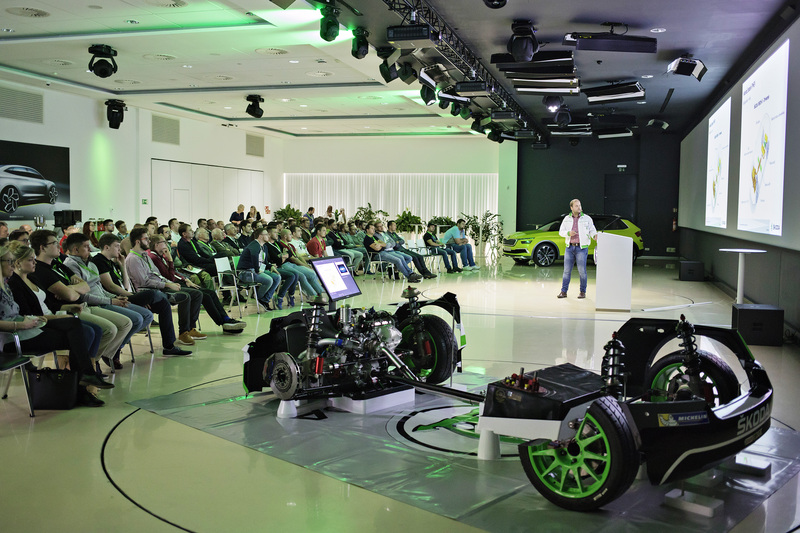 The students were able to learn more about how things work in production and development at ŠKODA. And I would say that the event was also beneficial for us, the staff. This is a hot topic these days. 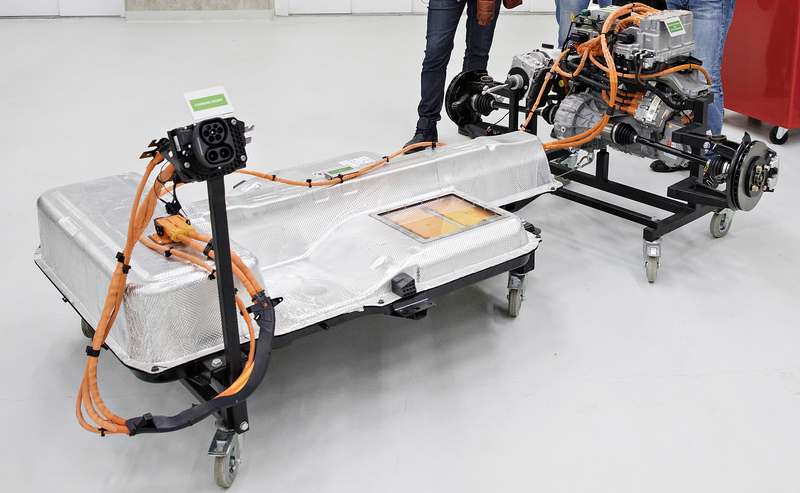 While there are die-hard supporters of purely combustion engines, a lot of people are now considering whether to use electric cars in the future, as development progresses and the driving distance improves. It is important environmentally and in terms of cost. Petrol and diesel will continue to go up in price in the next year, and people will do the maths very quickly. With an electric motor you can also accelerate faster, the clutch won’t let you down – because you don’t have one, and so on. This is about leveraging the most we can from technical progress. The questions were about the presentations that the students had seen. It was evident that they were listening intently, and the questions logically focused on gaining a deeper insight. They were interested in things like battery recycling and how much a battery cost. I was surprised when I heard a question about what to do if something happens to one of the battery cells. The answer is that the entire battery has to be replaced, because customer safety comes first. I think that about 10 to 15 people were interested in the matter at hand. A colleague told me that two students talked to him about coming to our component production unit for work experience. They were interested in the development of traction batteries and were surprised at how far we had progressed here. They should keep abreast of developments so that they don’t miss out on something. Enthusiasm and languages are also very important. Then there are no issues going abroad and gaining lots valuable experience. That’s how it was for me, too.